Jazz vocalist Shin Yeah-won has been nominated for a Latin Grammy award for her album "Yeahwon," which she released in the U.S. after becoming the first Korean to sign with U.S. jazz label Artistshare. The 30-year-old was put up for selection for the Best MPB (Musica Popular Brazileria) Album for the 12th Latin Grammy Awards. The awards, created in 2000, honor works recorded in Spanish or Portuguese that are released globally. Shin was nominated along with such Brazilian musicians as singer-songwriter Milton Nascimento and composer Caetano Veloso. After Shin debuted in Korea with a solo album in 2001, she developed an interest in Brazilian music and learned Portuguese from 2003. In 2006, she went to the U.S. to study, and became a jazz vocalist after graduating from New School University with honors in 2007. Shin is the daughter-in-law of conductor Chung Myung-whun, art director of the Seoul Philharmonic Orchestra. 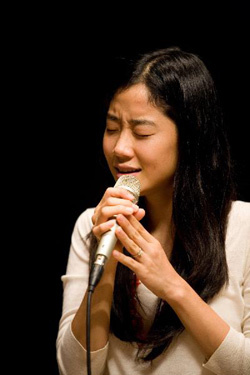 Her husband, 29-year-old Chung Sun, is the maestro's second son and also a prominent jazz guitarist and record producer. In a phone interview with the Chosun Ilbo on Thursday, Shin said she feels as though she has already been honored by having the chance to work with some of the best musicians in the field at her recording label. "I'm flabbergasted at having been nominated with these great musicians who I've admired for so long," she said. She credited her husband for finding her a good Portuguese teacher and overseeing the production of her album. The final results of the Latin Grammies will be announced in Las Vegas on Nov. 10.